Don’t forget to Vote and Donate on Monday, June 11! Food donations will be collected in a DPW truck at the voting polls…help us stuff the truck! Needed items are peanut butter, jelly, pasta sauce, large bottle of juice and juice boxes. You can also stuff the truck on Tuesday – Saturday, June 12-16 at the Fire/Police station. THANK YOU! 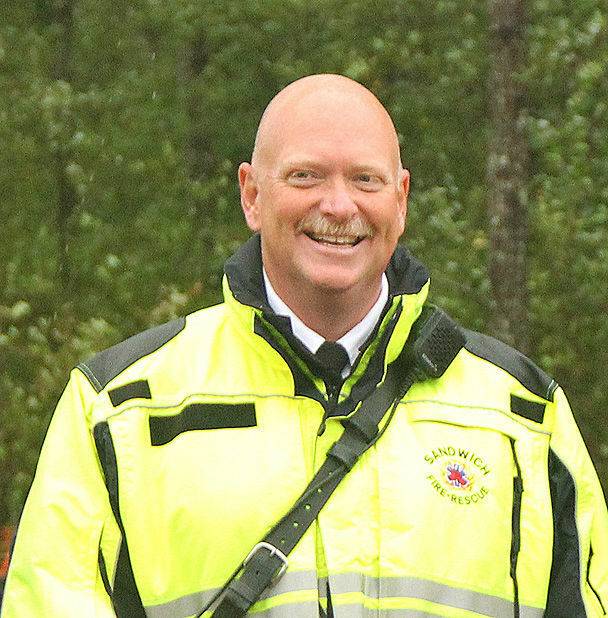 Fire Chief William C. Carrico II will be leaving his Sandwich post next week to become the Medfield fire chief. Chief Carrico did not respond to a request this week to explain why he wants to leave Sandwich and what he views as his top accomplishments during his four years with the town. He did, however, discuss those topics with the Medfield Board of Selectmen during a televised meeting earlier this month. He said that he had met the top challenges in Sandwich—building up staffing levels; ensuring that the firefighters and paramedics have safe, new quarters; and bringing professionalism to the department. Sandwich Town Manager George H. (Bud) Dunham said he was saddened by the news that the chief was leaving. Chief Carrico helped the town secure a $1.2 million federal grant that enabled the East Sandwich fire station to be renovated and fully staffed. The grant came from the US Department of Homeland Security’s Federal Emergency Management Agency. Mr. Dunham said at the time that the two-year grant would allow the town to hire firefighter/paramedics, and move ahead with its public safety plan, despite conflicting messages from voters. At the 2016 Town Meeting, Sandwich residents overwhelmingly approved a $17 million plan to build a public safety complex in South Sandwich, and renovate the East Sandwich station—adding dormitories and other amenities. At that meeting, residents also approved a separate $750,000 allocation to hire eight firefighters/emergency service personnel. But the $750,000 measure—technically called a Proposition 2 1⁄2 override—also required a majority vote during a regular election three days later. The override failed, narrowly, when voters went to the polls. In the days before that Town Meeting and election, Mr. Dunham said that if the override failed, the East Sandwich renovations would be scrapped because the town could not afford to staff the improved facilities. The $1.2 million grant changed all that. The Staffing for Adequate Fire and Emergency Response (SAFER) grants were created to provide funding directly to fire departments and volunteer firefighter organizations to help them increase or maintain the number of trained, frontline firefighters available in their communities, according to the FEMA website. Chief Carrico also helped negotiate for administrative offices to be added to the $17 million public safety complex now under construction at Cotuit and Quaker Meetinghouse roads. The complex will house a new police headquarters building and a fire substation. Chief Carrico told the Medfield selectmen he had similar goals for that town. He also wants to add paramedics and ambulance service to the department. Medfield Town Administrator Michael Sullivan said on Thursday that Chief Carrico’s salary has not yet been made public because contract details are still being worked out. The previous chief’s annual salary was $136,000, Mr. Sullivan said. Medfield, southwest of Boston, encompasses about 14.5 square miles. The town, which has a population of about 12,000, has been searching for a new chief since last June, when William Kingsbury announced his retirement after nearly 30 years as chief. Shortly thereafter, the town appointed retired Hull Fire Chief Robert Hollingshead as interim chief. “He’s the right man for the job,” Mr. Hollingshead said of Chief Carrico when introducing him to the Medfield selectmen. Mr. Carrico served as chief of the Halifax and Duxbury fire departments before coming to Sandwich. He believes in beginning cadet programs and talking with high school students to encourage them to consider careers in emergency services. Sandwich Fire Chief William Carrico has resigned from his post after four years leading the department. Town Manager Bud Dunham advised selectmen April 26, that Carrico has submitted his letter of resignation in order to become the new fire chief in Medfield. Carrico’s last day is May 4. Dunham said he is poised to appoint Sandwich Deputy Chief John J. Burke as acting fire chief. Dunham praised Carrico and his tenure in Sandwich. Thank you for acting on the Ambulance Fee Alert we sent you on November 1st! The sweeping health care cost containment bill approved by the Senate last week does NOT include the provisions opposed by the MMA to cap ambulance fees. Your calls on this important issue made a big difference. As you recall, an early version of the Senate’s health care bill included provisions to cap municipal ambulance fees and impose a state-driven system to oversee the local fee-setting process. That proposal would have imposed financial burdens on cities and towns, and made it difficult for communities to fund emergency response services. Fortunately, the Senate Ways and Means Committee eliminated the fee-capping provisions from the legislation that was debated and passed by the Senate. This came after productive conversations between the MMA, legislators, Senate staff, Fire Chiefs and other EMS Coalition partners, as we explained why ambulance fee caps would hurt local budgets and undermine high-quality municipal EMS programs. The MMA’s effectiveness on this issue was possible because of the large volume of calls that Senators received from local officials, as you responded to our Nov. 1 Action Alert. Your calls were the key to our success. The health care legislation now moves to the House, where a bill is expected to emerge for debate early next year. When you see your Senators over the upcoming holiday season, please thank them for protecting local fee-setting authority for ambulance fees, and when you see your Representatives, please explain why ambulance fee caps would be bad for cities and towns. And please thank them all for supporting municipal issues throughout the year. If you have any questions regarding ambulance fee legislation or the Senate health care bill, please call or email MMA Legislative Director John Robertson at (617) 426-7272 x122 at any time.